So, basically, it’s on. Third parties can have access to bank customer data and there’s nothing that banks do about it. Who will benefit from this? We have long advised our clients that the competition to incumbent financial services providers will not be fintechs. I wrote last year that the major beneficiaries of the regulators pressure to open up the banks will be the internet giantswho already have the customer relationships. Of course, when I say it, no listens. But when the woman at the top of Europe’s biggest retail bank weighs in, I suspect one or two people may sit up and pay attention. From Santander chair calls EU rules on payments unfair. Is this, as Ms. Botin asks, really fair? If it isn’t, what should be done about it? 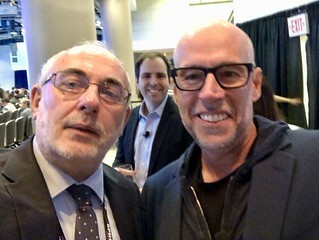 Earlier this year, I had the honour of chairing Scott Galloway at the KnowID conference in Washington. Scott is the author of “The Four”, a book about the power of internet giants (specifically Google, Apple, Facebook and Amazon). In his speech, and his book, he sets out a convincing case for intervention. Just as the government had to step in with anti-trust acts of the early 20th century in recognition of the fascist nature of monopoly capitalism, so Scott argues that they will have to step in a century on and, again, not to subvert capitalism but to save it. His argument centres on the breaking up of the internet giants, but I wonder if the issue of APIs might provide an alternative and eminently practical way forward? Ana suggested that organisations holding the accounts of more than (for example) 50,000 people ought to be subject to some regulation to give API access to the consumer data and it seems to me that this might kill two birds with one stone: it would make it easier for competitors to the internet giants to emerge and might lead to a creative rebalancing of the relationship between the financial sector and the internet sector. This gives us the obvious regulatory response to the need to create a level playing field: let us put in place a set of reciprocal rights and responsibilities. Forum friend Simon Lelieveldt, who I always listen to on these matters, also suggests this as the way forward. He says that if the European Commission wants a “balanced” market with effective competition then it should “redress the design errors in the PSD-2 and allow banks to ask fees and allow them reciprocal access to the customer data”. I think this gives us a sensible outline manifesto for the next generation of PSD2/GDPR and such like: open, transparent and non-discriminatory pricing for API access to customer data (with the customer’s consent) irrespective of the nature of the organisation: bank, media, telecoms whatever. Tim Richards and I will be running a workshop session on open banking and the strategies for incumbents, fintechs and competitors on Wednesday June 6th at Money 2020 in Amsterdam just a couple of weeks from now. Please do come along and join in the discussion and debate around this crucial topic. We look forward to seeing you there. Doesn’t the GDPR right to data portability mean that I can insist that facebook releases (carefully chosen word) my data to anyone I authorise to have it? I suppose you could log in every morning, file a GDPR request and then when the e-mail with all of your data in it arrives then you could forward it to all of the financial services organisations that you deal with and then they could look through it and copy and paste any relevant data into their internal systems, yes. But I think API access would be better.